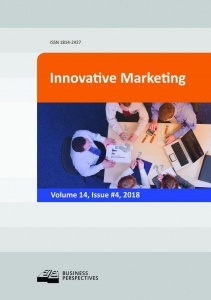 The journal focuses on the results of scientific researches, concerning utilization of innovative marketing instruments, their nature, varieties, functions, efficiency, etc. It also analyzes the crucial issues of market demand and supply imbalances, prices prediction, and forecasting, organization of R&D for the innovative products and services, advertising and PR-management. The privilege of publication is given to the original, conceptually new and contemporary manuscripts, which are devoted to the critical analysis of marketing, overview of new marketing tendencies, innovative techniques of marketing, including psychology methods and so on. The target audience of the journal includes researchers, scholars, lecturers, students, and practitioners. Key topics: State policy in the sphere of innovations and innovative marketing; Innovations in forms, methods and tools of marketing; Innovation management in companies; Company staff`s stimulation for marketing innovations development; Corporate governance and social responsibility; Corporate culture and innovative marketing; Property rights for innovations and inventions; Econometric methods and modeling in innovative marketing; “Know-how” technologies in innovative marketing; Big Data analysis and innovative marketing; Marketing of financial services.